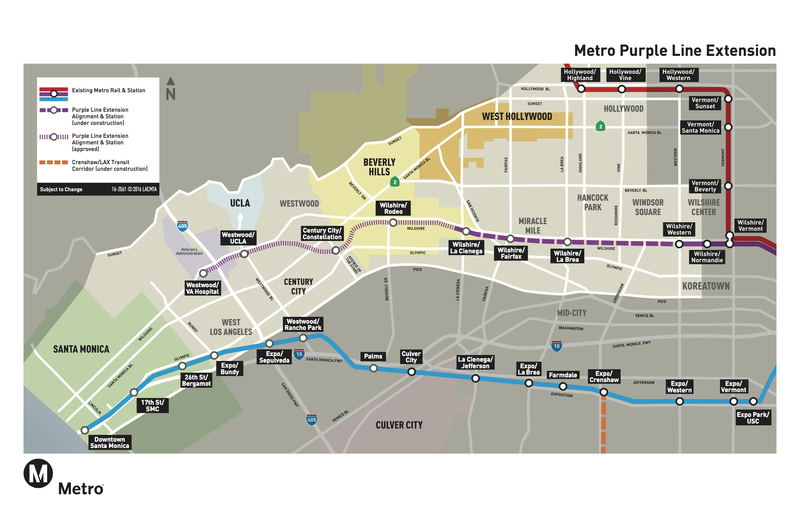 •The Purple Line Extension is a subway line that will eventually run between downtown Los Angeles and Westwood. At present, the Purple Line runs as far as the intersection of Wilshire Boulevard and Western Avenue in Koreatown — the last station is right across from the Wiltern Theater. •The subway extension is being built in three sections. 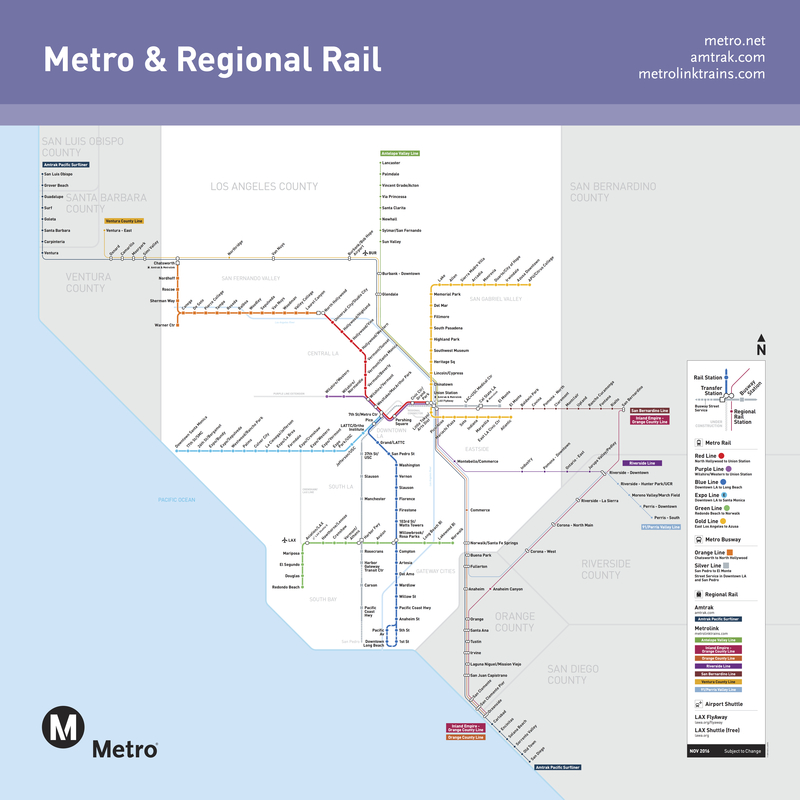 The first is 3.9 miles long and will run beneath Wilshire Boulevard with stations at Wilshire/La Brea, Wilshire/Fairfax and Wilshire/La Cienega. This part of the project is under construction and forecast to open in late 2023. 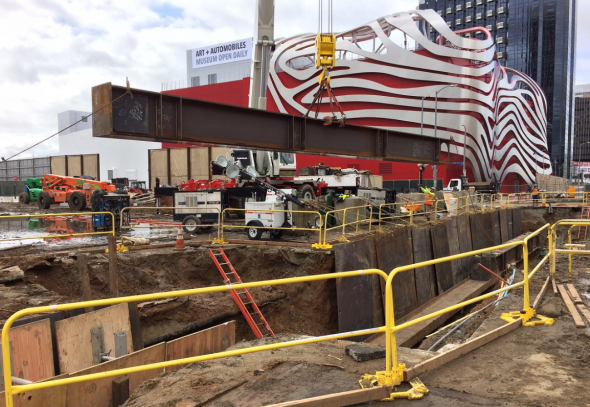 At present, the station at Wilshire/La Brea is being excavated and the street decking is being installed at Wilshire/Fairfax to allow digging to begin there. Tunneling is set to begin in 2019. Decking work for the future Wilshire/Fairfax Station earlier this year in front of the Petersen Automotive Museum. Photo: Metro. •The second section extends the subway 2.6 more miles to a station in Beverly Hills near Wilshire and Rodeo Drive (the entrance will actually be at Wilshire and Reeves) and a second station at Avenue of the Stars and Constellation Boulevard in the heart of Century City. Early work is underway on this section with major construction getting underway in 2018. •Completion of the second subway section is anticipated between 2024 and 2026. •A third and final section will extend the subway another 2.6 miles, with stations at Wilshire/Westwood and the final station at the Westwood/VA Hospital Construction on this section — with funding from the recently approved Measure M sales tax — is planned to begin as early as 2019 and a finish date also between 2024 and ’26. Measure M allows this section to be accelerated; otherwise it would not have been done until the mid-2030s. Gulp! •As for travel times, it’s expected to take about 19 minutes to travel from the future Century City Station to 7th/Metro Station at the intersection of 7th Street and Figueroa Street in the heart of downtown L.A.
•One example of how the Purple Line will speed up transit trips: at present it takes 90 minutes to two hours to travel by light rail and bus between Old Pasadena and Century City. After the Purple Line is open, that trip should take 60 minutes (or less), transfers included. •As if to prove having local money helps attract federal money, the Purple Line Extension received a federal grant of $1.25 billion for section one and $1.187 billion for section two. Metro is currently working on securing a grant for section three. The Purple Line Extension’s home page on metro.net is here. You can also follow the project on Twitter and Facebook. Here’s an album of recent construction pics on our Flickr page. Want to be a Metro Sustainability Council member? “The Purple Line Extension will offer transfers to other Metro Rail lines, as well as numerous bus lines…” Huh? The Purple Line EXTENSION does not cross ANY other Metro Rail lines. The current Purple Line connects now. But the map you reference does not show ANY Metro Lines connecting to the EXTENSION. Correct. Steve should have qualified that statement by noting the need to complete other projects in the Measure M plan, such as Crenshaw Northern Extension and Sepulveda Pass Transit Corridor. Is there still any momentum on making the purple line a “subway to the sea”? I thought I heard several years ago that Metro purchased an old Sears (or other brand) department store building in Santa Monica that was slated to be a subway station. It seems like extending the purple line to downtown SaMo would be a no-brainer. What’s the story with that? The old Sears Auto Center in Santa Monica is now the western terminus of the Expo line. Sadly, there does not seem to be enough political will to take the Purple line all the way to the beach. I do wish we could at least get it as far as Bundy, which is very high density. By the time the Purple Line opens to Westwood in 2030 (Just being a realist) there will likely be the pressure to extend it further. Question will be if that would be to Bundy and then to DTSM or Bundy and then north under Sepulveda Pass. The latter would be an interesting kill-two-birds approach. I suppose the only question is what happens when you build the next phase of Sep Pass project south to LAX. If there are really no plans to end it at the sea It would be nice if they continued the 2.3 miles down Bundy to the Expo line. Becomes much more useable.